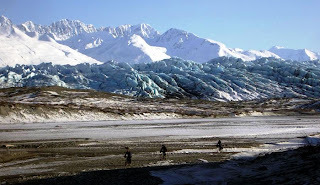 The only place rideable after the recent snows is out of Knik Lake for us since it is used by local mushers and snowmachines. Rideable it was, but a bit slow. We averaged 4.5 mph for our 32 mile ride to the Point McKenzie Store and back. We ran into a bunch of Susitna 100 racers that were training as well out there on part of the new course they use this year. The folks that run the store and restaurant are super nice people and make great hamburgers. 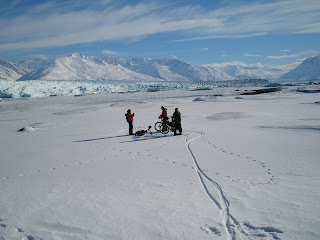 After one of those I rode back in just my base layer and a light vest at 18 F on our way back to Knik. The foot of snow that fell on the trail is the consistency of powdered milk despite all the traffic on the trail and not setting up.The Aurora 50/50 mushing race and the Klondike 300 from the Tug Bar had started in the morning and parts of the trail had been groomed. It was a big workout for a short ride on the trail. 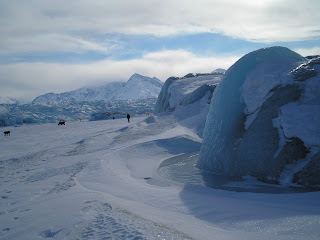 I have seen this kind of snow, but worse in 2006 between Nikolai and McGrath. The trail would not set up even after lots of snowmachines on the trail. There was a significant warm up in the forecast for today, it was 47 in Palmer, 26 in Wasilla, those warm temps usually really help set up the trails. It is 25 degrees here in Chickaloon. By Wednesday it is supposed to cool off again. 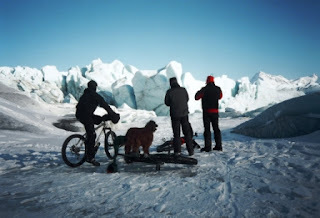 We hope to do our first ride this year to the Knik Glacier next week, one of our all time favorite rides. 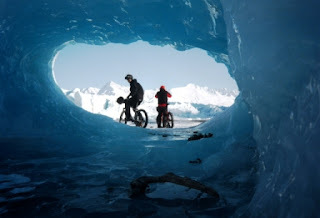 It is a 42 mile ride on gravel bars, crossing creeks and main channels of the Knik River and finally the huge glacier lake with frozen ice bergs and the 4 mile wide head wall of the Knik Glacier. I had a broken spoke on my front wheel yesterday, I made it back to the parking lot without major issues though. Bill is rebuilding my wheel today.